On the last day of July, BDJ sent me the month’s box, which may explain why this is late. BDJ is one of the top subscription boxes in the Philippines, if you’re not familiar, and it only costs Php 580 (or a little over $13) each month. To be honest, I was contemplating on not posting about this box because I didn’t really find it too exciting. Thought I’ve been sent these boxes for a few months (maybe even a year now), I was never required to write these posts. I usually find BDJ boxes to be quite OK, if not great… Good enough to post about anyway. BDJ has built a reputation for itself as a kind of reliable subscription box with thoughtful picks for boxes. This box was so dull to me that I didn’t even want to post about them, but going through each item, I had a thought (more on that later) and ended up writing up a post anyway. Keratin Complex Travel Velvet Care Kit (Php 459) — this shampoo and conditioner set was one of the biggest items in this box, both in heft and value. This claims to provide “gentle cleansing” for dry, chemically processed or damaged hair. 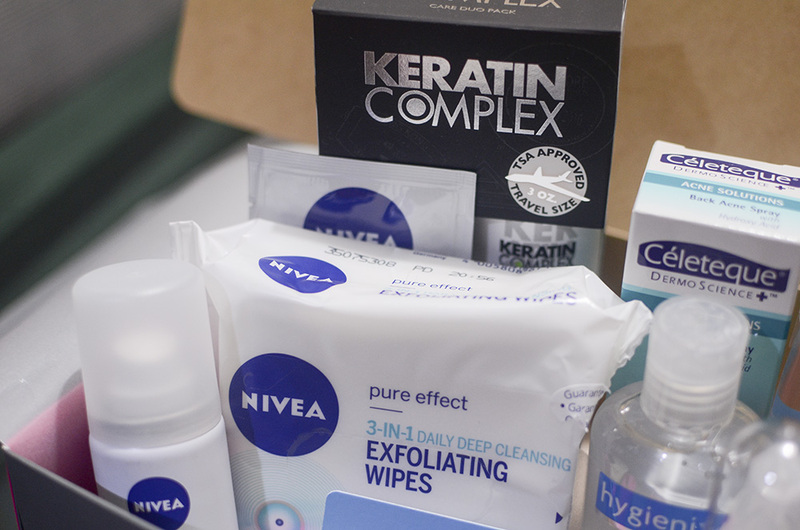 Nivea Travel Kit, incl. Nivea Pure Effect Exfoliating Wipes (Php 139), Nivea In Shower Skin Conditioner (Php 109, but the box only has a small sachet), Nivea Anti-Perspirant Invisible Spray (Php 184) — I dig the inclusion of facial wipes, I feel meh about the skin conditioner, and I have no use for the deodorant because I don’t wear it anymore. Celeteque Back Acne Spray (Php 320) — Not sure why you’d need a separate acne spray for the back, but this one has salicylic acid, gluconolactone (removes dead skin build up). Hygienix & Vitress, incl. Hygienix Hand Gel (Php 45), Hygienix Hand Spray (Php 40), both useful but I am fully stocked with my Human Nature Hand Spray for my antibacterial needs; Vitress Heat Protect (Php 75), Vitress Hair Repair (Php 75), both pretty useful for hair care. Enchanted Eyeshadow Palette in After Midnight (Php 199) — I got the same shades as I did last time (this was included in another BDJ Box some time last year) and didn’t really get on with it. Pink Sugar Fine Fragrance Mist (Php 299 or Php 349 ea, depending on what collection) — I got the scent Be Happy (lily, white freesia, mimosa, and yellow plum) and it’s not really my cup of tea personally, but it’s a great size so I hope the scent you get if you’re subbed to this is something you like! OK. So, this box… seems very utilitarian. I was so unimpressed when I first opened it because a) the weight of the box excited me and I thought about what might be inside, and b) I fixated on that eyeshadow trio, AKA a repeat product and shade for me that turned out to not work so well for me. Then I got over myself and thought about what “value” means to me. In the context of subscription boxes, at least. 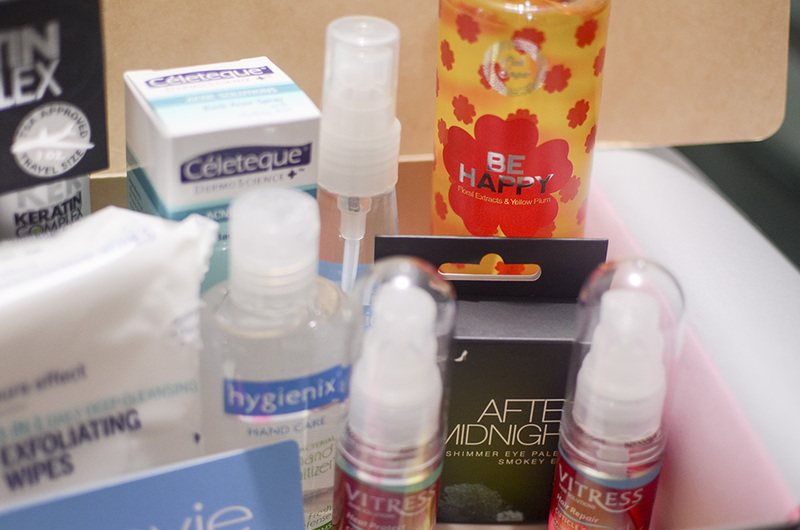 At just Php580 or $13+ every month, BDJ manages to send an assortment of products that are fun to try and receive. When I think about value, the first question I would like to say I normally think about is this: Did you get a box that’s at least worth the number that it costs? Then I consider what items would be of actual use to me. In reality, a lot of my reactions and impressions are influenced by whether or not the contents of this box excite me. This box did not excite me… but at least half of it is stuff I’d actually use or consider using. I could be wrong or am generalizing (I don’t mean to! ), but those are my thoughts on sub boxes and value. Subscription boxes are always risky, however, so if you’re not into testing many different things out or if you’re super picky, they’re probably not for you. I’ve discovered a few gems with the few ones I’ve tried, though, so I think it’s a matter of picking the one that you think fits you and what you’re looking for. I’m subscribed to the August box. Goodluck to me. I had glamourbox for two or three months and I quit. Anyway, I subscribed to the BDJ Box because of the grocery items. Is that weird? Most people won’t like that. But I figured, I buy most of the same products from the supermarket, I might as well try new stuff. I have a feeling that I’d give away at least half of the contents. If I get 1 or 2 items that would cost me about the same as the box I guess I’d be ok. I subbed to Glamourbox for one month and was a bit meh with what I got, though I do like majority of the brands that they carry. I don’t think it’s weird! I think it really all boils down to what you are expecting from a particular box. 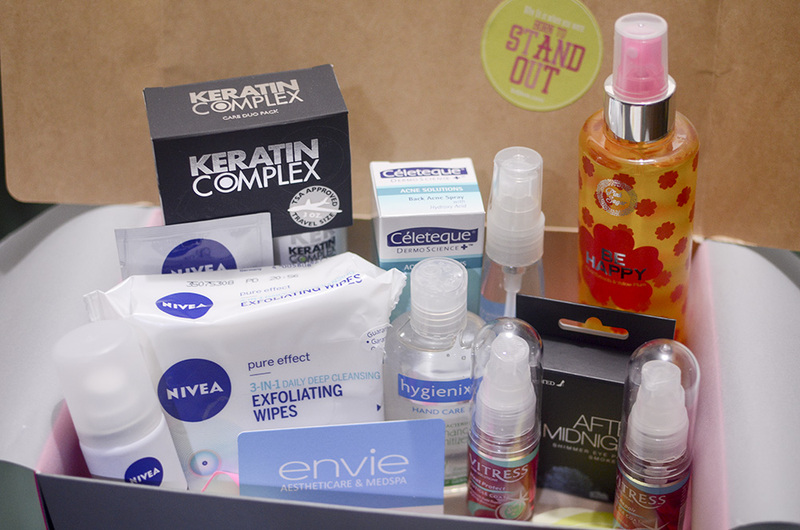 Haha I mean, like I said, this box isn’t bad, but I wasn’t expecting daily-products to be part of it, you know? Never really like subscription box, although I have to say BDJbox is pretty great (or at least consistent) from what I’ve been seeing. Pero, idk, the one time I subscribed to a subscription box, I was happy for a few hours, then I think ay sayang I could’ve bought a lipstick I actually really like for the price of this box. One of the things that made me stop subscribing to BDJ is the repeat items. They seem to be consistently including things they already put in previous boxes. Maybe they don’t have a big percentage of long-term subscribers? It certainly turned me off, as I put a huge (negative) value on repeats. I don’t really mind what Rae called “grocery” items. True! I kind of feel like their subscribers are, to some extent, pretty loyal! But I’m not sure about that, obviously. But yeah. I’m OK with repeat products if they’re products I like/love! I was thinking about subscribing to BDJ. But I don’t think subscription boxes are for me. I wasn’t too happy with the Glamourbox that I got a few months back. But let’s see. I might still give BDJ a try. Yeah, I think it’s pretty risky, honestly! BDJ is generally pretty consistently good, so this was a bit of a weird box for me. You’ve summed up why I’ve never been tempted to subscribe to a service like Birchbox or Ipsy or whatever. I have a limited makeup budget and I want to spend that money on makeup that I actively want because it excites me. And in most of the subscription box reviews I’ve read, the thrill of discovering great new products seems overshadowed by the letdown of “great, another pack of facial wipes.” The only service I’d consider subscribing to is Le Métier de Beauté, thanks to your reviews, but I can’t justify the expense right now. Yes! HAHA reading some Ipsy and Birchbox box reviews are so fun for me, because they are obviously soooo let down, I kinda feel a bit bad for them. D: I love my LMdB box, but you’re right, it’s so expensive. I also tried Quarterly.co subs for a while and did 2 months of Not Another Bill before I nixed most of my sub boxes, because they just really add up! I actually like this box for practical reasons. I could actually use everything in this. I am only subscribed to BDJ at the moment. I see your point of discovering new items instead of getting the usual things, and repeats. I am actually 50-50 about this box. I thought it was super exciting because it is heavy and big but after seeing what’s inside, meh. I get what you’re saying, that this box has become more utilitarian than exploratory. I’m not one to dislike a box because all it has going for it is value for money, but if I had my way I’d rather have a bunch of deluxe sized samples from unheard-of brands and collections. Yeah, I getcha! IDK, I’m very on the fence about subscription boxes in general. I like having some semblance of control over the things I buy even if they’re surprise boxes. I think that the reason why this was surprising for BDJ is because I’ve come to expect really GREAT boxes from them and this felt waaaay off the mark. Not bad, but just not BDJ.